Each heir wants the house. Yet to buy the other out, two siblings must team against one. Just as in girlhood, Corlis is torn between allying with the decent but fearful youngest and the iconoclastic eldest, who covets his legacy to destroy it. 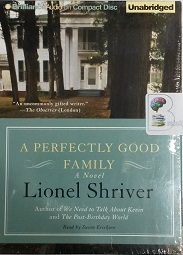 A Perfectly Good Family is a stunning examination of inheritance, literal and psychological: what we take from our parents, what we discard, and what we are stuck with, like it or not.